The European Commission has dropped their anti-trust charges against Microsoft following long-winded arguments over the legality of providing Internet Explorer within Windows. Under the terms of the deal, around 100 million PCs throughout Europe will show a browser ballot screen in March 2010. The ballot screen will appear during a Windows update for XP, Vista and 7 assuming the user has retained IE as their default browser. Those that buy a new PC will see the screen the first time they access the web. another 7 browsers will also appear in less-prominent positions: AOL, Maxthon, K-Meleon, Flock, Avant Browser, Sleipnir and Slim Browser. The browser list will be updated at least once every six months with choices changing with the popularity of the software. Millions of European consumers will benefit from this decision by having a free choice about which web browser they use. The ruling will act as an incentive to rival browser makers to continue developing and improving their products. Whilst I’m pleased users will be educated about alternatives, I’m not convinced the ballot screen will have a major impact on browser market share. A choice of 12 options will be confusing for many novices. 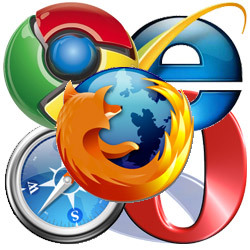 Those making an uninformed or random choice will still have a 50:50 chance of opting for an IE-based browser! Do you think the browser ballot screen will make a difference? Should Microsoft roll it out worldwide? Does the use of the word “ballot” annoy you? Is it a case of alliteration prevailing over interpretation? !